A blended vegetable oil is a mix of two edible oils where the proportion by weight of any edible vegetable oil used in the mixture is not less than 20 per cent. The blend is supposed to conform to set standards and be clear, deodorised, free from rancidity and any other animal and non-edible oils, or fats. The blended oils are normally known by their brand names. These oils are being promoted as healthier alternatives to traditional cooking oils because the two oils that are blended contain a better proportion of the essential fatty acids and a better balance of the PUFAs (poly unsaturated fatty acids), MUFAs (mono unsaturated fatty acids) and SFAs (saturated fatty acids). Dietitians are beginning to recommend the blended oils in place of, or in addition to the traditional oils. It's a good idea to have a healthy balance of the fatty acids. If you wish to do so by using blended oils, you need to make sure that the right proportion of fatty acids is obtained by using the oils. 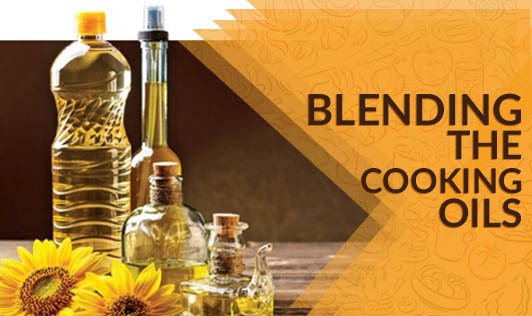 If you are not used to blended oils, then using a combination of two different oils for cooking also helps. For example, sunflower or safflower oil can be used for one meal and groundnut or gingelly or mustard oil can be used for another meal. Another way of combining oils is to use one variety of oil for all the gravy dishes and another variety for all dry food items. Whatever the oil blend or oil mix may be, the fact that every gram of oil contains 9 calories does not change. If taken in excess, the combined or blended oils will still have the deleterious effects on health that single oils have, the commonest being weight gain! While you might want to use mixed oils, make sure the quantity is well contained.